Hooking the VPN’s raison d’etre to torrenting may raise eyebrows, as the technology is often used to illegally download copyrighted media from a peer-to-peer network. But the fact remains that TorGuard offers extra layers of privacy protection for not just torrenting, but for all types of data transfers, and that’s a selling point for anyone concerned about being surveilled. TorGuard claims to have 3,000 servers located in 51 countries. The company’s VPN servers support a number of connection protocols including PPTP, OpenVPN, L2TP/IPSec and IKEV2. If you prefer using an open source VPN client such as Tunnelblick, you’ve got plenty of options to choose from. Once connected, your data will be protected by the same AES-256 encryption that the majority of other VPN providers use. 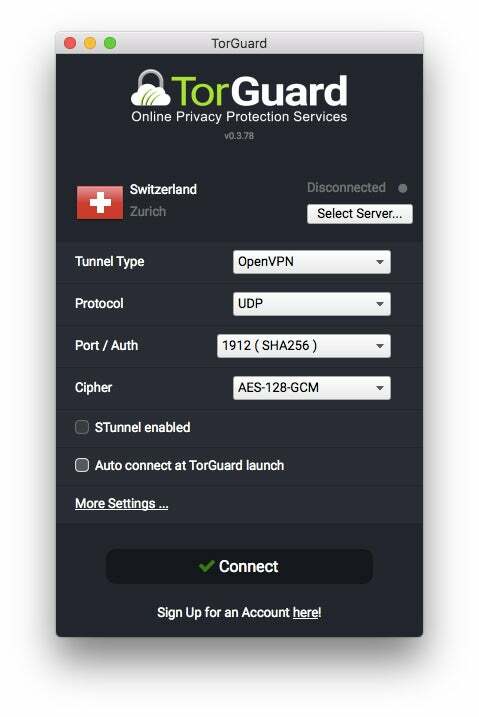 TorGuard claims that their VPN service can even be used to stealthily bypass the DPI firewalls of countries like China where VPN use is blocked by the government. The company has a strict no-logging policy, which makes it difficult (if not impossible) to track TorGuard customers down. When you add in the fact that the company’s offices are located on the Caribbean island of Nevis, which takes no part in Five, Nine, or Fourteen Eyes information sharing, TorGuard’s VPN service seems ideal for anyone interested in maintaining their complete online privacy. Using TorGuard on macOS feels clunky. It’s a minor thing to complain about, but the company’s VPN interface feels terribly dated. When you pay a premium for service, it seems reasonable to expect a certain amount of polish to justify the expense. TorGuard’s UI simply does not provide this. For example, when starting up the app, users are presented with a number of technical options—but there’s no explanation, even with a mouseover, of these options. The company’s VPN plan allows for five simultaneous connections. Additional connections can be had for an additional dollar per device, per month. During testing, connecting to TorGuard’s servers resulted in the following upload/download speed reductions versus connecting to the internet without a VPN. TorGuard’s subscription pricing can be a little bit overwhelming. In addition to VPN services, they also provide proxy server access, anonymous email subscriptions, and plans that offer all three of these services combined. If you choose the company’s $10 per month VPN package, you’ll only be greeted by more options. That $10 per month base charge can quickly jump higher if you’re not careful. TorGuard offers the same VPN service at a quarterly cost of $20, six months for $30, a year for $60, or two years for $100. While we appreciate a deal as much as the next person, the way TorGuard presents their discounted rates is byzantine, to say the least. If you survive the process of choosing a plan, there’s no shortage of payment options. Along with the usual suspects like PayPal or a credit card, TorGuard also accepts Bitcoin, Litecoin, other cryptocurrencies via CoinPayments, Paymentwall, and even gift cards. For those wishing to remain truly anonymous online, having these options is outstanding. TorGuard provides users with respectable connection speeds to servers in the U.K., multiple anonymous payment options, and a no-logging policy, making it ideal for those who value their privacy. However, due to its complicated pricing scheme and an unfriendly user interface, it’s not an easy recommendation for less tech-savvy types.